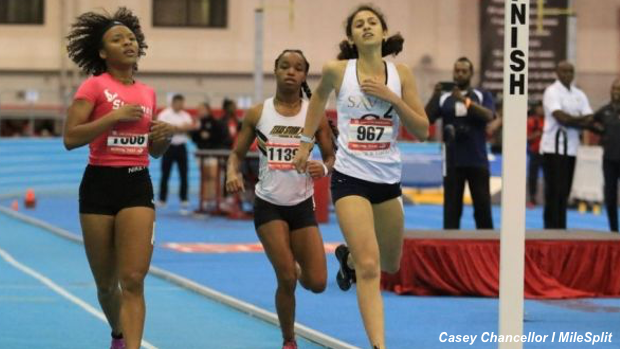 It is rarely easy for freshmen to make significant impacts on the high school varsity track and field level in year one. However, there are always a few who just have that "It" factor from the start. It is also too early in the track and field season to have a big picture and huge sample size of the talent in the entire class. However, there has been a small field to analyze and there are at least four freshman girls who have shown they might have the opportunity to impact their team and the state in their events. Flower Mound distance star Natalie Cook has already proven herself during the cross country season when she hit the ground running ahead of the curve. What had to help, was that her father is the mastermind behind the Flower Mound distance program that has become one of the top programs in the state. This indoor track season, Cook has already been cooking! She started last week a huge win at the Texas A&M High School Indoor Classic with a big win in the 2 mile. On the A&M big stage, she ran a 10:51.59 against some very tough and experience runners. This weekend, she took things a step further. Cook won the 3,000m at the Carl Lewis Invitational by running 10:01.17. On the first lap of the race, she lost her shoe as another competitor stepped on her foot helping to remover her shoe. Proceeding with just a sock on her foot, she managed to facilitate through the 15 lap race and put on a kick the last 400m for the win. Cook is in the tough Region 1-6A and it will be a daunting task to qualify for state, but she definitely has the chance to make it happen in either the 1600m, the 3200m, or possibly both. There are two 400m freshmen that are having outstanding starts to 2019. Austin St. Dominic Savio freshman Hali Murphy has a very good shot a making a big impact on both her team and in TAPPS. Murphy ran a 57.49 in the 400 at the Carl Lewis Inv. That is a very impressive for a freshman in the indoor 400m. Her indoor time would have qualified her for the 400m finals in every TAPPS classification in 2018. Murphy will definitely be impactful on her team, in TAPPS, and even in big invitational meets. Like Murphy, Fort Bend Marshall freshman quarter-miler Cesley Williams is rolling in the 400m. She has an indoor time of 57.55 from this weekend. Last week at LSU HS Classic she only ran a 60.27, but she bounced back this weekend at Carl Lewis. Williams could contribute to several fast Buffalo relays in 2019 including a 4x400 that the team is optimistic about. Potential open 400m regional or state qualifying berths aren't out of the question either. DeSoto Freshman jumper Rebecca Anderson popped a 35-4.75 in the triple jump at Texas A&M. Anderson is the top freshman in the event and the second ranked non junior or senior in the triple jump. As she gets stronger, Anderson could potentially get up to the 37 or 38 foot area. With potentially able to get tips from All-World North Texas Cheetahs (NTC Elite) teammate Jasmine Moore, Anderson will take over the reins from a more than quality teammate. Her DeSoto team is stacked in the sprint event and relays and throwing events and Older sister Rachel Anderson is the top middle distance runner at the school. Anderson's possibility to score points in the jumps for the Eagles could be huge in their attempt for a four-peat UIL 6A state championship.